We welcome you to be part of a nationwide network of amazing ladies that all share one thing in common: a love for offroading! (Ok, and maybe dirt under our nails too!) 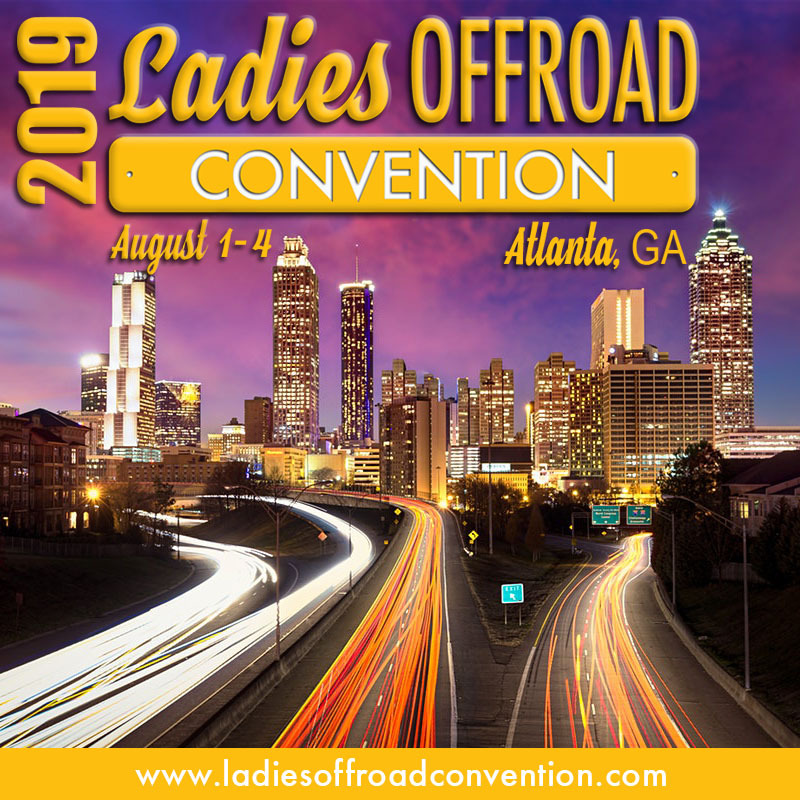 Founded by Charlene Bower, Ladies Offroad Network is a community for offroad ladies across the country to join together to Guide, Educate and Motivate each other while enjoying their 4x4, UTV, ATV, MC, snowmobile, RC car, etc. Our membership rate is $120 per year. Become a member today! Would you like to earn $5 per referral to www.BowerMediaStore.com? We appreciate you letting your friends know about Ladies Offroad Network and want to give you a gift of your choosing in return… in the form of store credit! Be sure your friends use your full name as the referral person when signing up. We will reconcile your referrals quarterly and issue store credit. Looking for that perfect gift for someone special? Click here to give the gift of Ladies Offroad Network Membership! When you become a member, you will be given the opportunity to have your own personal page featured on Ladies Offroad Network. Your webpage includes a paragraph about you, social media links, and a Q&A. It will also list and link the specifics of your vehicle. Plus, it will feature the articles you submit to Ladies Offroad Network. This is a hub for everything you do offroad! Once a member, we will email you a content outline for you to complete. Do the best you can, and don’t worry if you don’t have a vehicle or have multiple. We also ask for photos that you own of you being awesome offroad! We will handle the editing and publishing process. You can email us to update your information at any time, or we will contact you annually for any new information. Based on our research, one thing is certain—conversations are being split up between social media outlets. Bringing the conversation to our forum helps eliminate that. Every member has the opportunity to participate, learn, and engage on the same level. Plus, Charlene hosts free tours that explain how to use our website and forum! On the forum, your profile will include a yellow member banner under your user name. The banner will be upgraded every year you renew your membership. There will also be opportunities to add banners as you participate in our different programs. As a member, you will have the ability to add a profile picture, custom title, and signature line, and attach photos and media to your posts. You will be able to see member only forum topics for example, the Location Specific area, Shopping Mall, Research Area, and more. In addition, you will be able to privately message other members and set notifications. Time to go shopping! As a member, you will receive a special discount code for 10% off all* purchases in our store, BowerMediaStore.com. This includes Ladies Offroad Network, I’m Not Just a Girl, Offroad Marketing School and Bower Media products. * Excludes Ladies Offroad Network memberships and renewals. 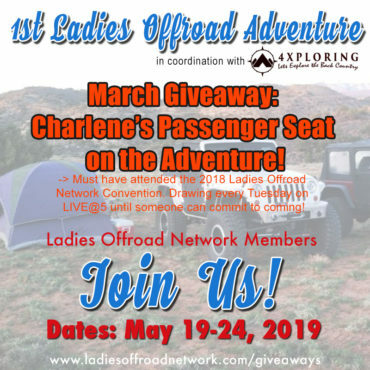 When you become a member of Ladies Offroad Network, you are automatically entered into a new member giveaway with a drawing at the end of the month. Each month’s package varies, so check our website for what you could win by becoming a member this month! As a member, you are eligible to participate our monthly giveaways. Each month’s prize is valued at more than $500! We appreciate you recommending Ladies Offroad Network so much that we also host a monthly referral giveaway. Make sure you tell your fellow offroaders to say that you referred them when they become a member so that you can be entered to win a new prize each month! In addition, will host other referral giveaways throughout the year, so keep telling people about us! We want to know what you think. Our members are at the core of our future, so we are giving you the opportunity to voice your opinions through polls on the forum and via email. Anytime you have a suggestion, question or idea, please don’t hesitate to let us know. Your idea may inspire the next poll! We host many fun events each year. As a member, you will be the first to know about these events and register early, especially if there is a cap on the number of attendees. Watch your email and check the mail for these special invites – we want you to join us! 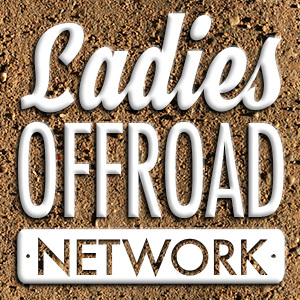 Ladies Offroad Network is proud to be able to provide multiple programs for offroad ladies. Membership is required to participate in these programs, which include being featured as a Business Owner, Offroad Group, Local Leader, Ambassador, and more. We hope that you will participate! When you become a member, you will receive a Ladies Offroad Network member sticker in your color choice. We love to send you stuff, so be sure to keep your address up to date! When you become a member today, your membership rate is locked in forever*, which means your rate will never increase! *Must maintain consistent membership through yearly, quarterly, or monthly renewal. Reestablishing a membership may result in a new rate. We are always adding new features and benefits with plans to roll out some amazing opportunities in the future. We hope all of our members will take advantage! Please contact us with any questions or concerns that you may have. We are here to help you be successful!